As the subtitle implies, this is an idea book. The wreaths are beautiful and the instructions simple. The focus is not only on giving guidelines for preparing the flowers and making the wreaths, but on sharing the elements of design necessary for striking out on your own. 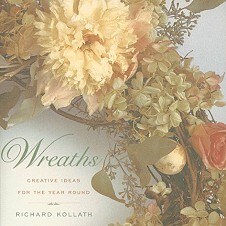 Mr. Kollath steers you through preparing your work space and choosing your tools as only someone who has made many wreaths could do. Instructions are given for air drying and silica preservation of flowers. There are also some wreaths made with fresh flowers. This is a book for those who want to use what they grow and find. There are even instructions for making your own grapevine wreath, which Mr. Kollath admits is one of his favorites. There are some pretty unusual ideas in this book, like making a baby's wreath with building blocks, and using small wreaths for package toppers. Whatever your color scheme or design theme, there is sure to be a gorgeous full color photo of one of Mr. Kollath's wreaths to spur you on.